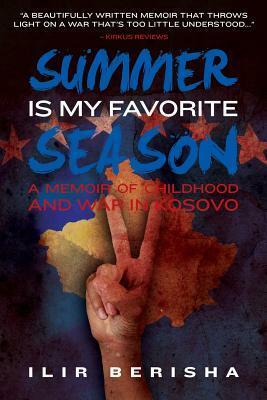 Summer is my Favorite Season is the true story of Ilir’s childhood growing up in Pristina in Kosovo. He lives with his parents, his older brother Shpetim and his little sister Fjolla but their lives are disrupted when Serbian forces take to the streets and they begin to hear rumours of villages burning. Their lives are changed when they, ethnic Albanians living in the Kosova region of the former Yugoslavia, are treated like second-class citizens when Slobodan Milošević and his government came into power. I knew nothing about the Kosovo War in the late 1990s and about the events leading up to it that started in the mid-1980s. The fact that Kosovo isn’t recognised by Serbia as an independent state and that there’s still tensions today (in this years World Cup two Swiss footballers of Kosovar-Albanian heritage celebrated their goals against Serbia by locking their hands together and flapping their fingers, in a gesture to resemble the two-headed eagle on Albania’s national flag) isn’t something that had passed me by, but the conflict and tensions were something I didn’t understand. As Summer is my Favorite Season is a memoir, it doesn’t go into extreme details of how and why the conflict started, instead it’s told through the eyes of a child and that makes it so much sadder and affecting. Things happen slowly and Ilir doesn’t even know or understand what a tank is when one park outside his family’s apartment building. It becomes part of the view from his window. He doesn’t understand why his father is always so focussed on the news or his mother can’t go to work, and it takes time for the affects of the conflict, which for a time was in the villages away from his family, to trickle into his life. Summer is my Favorite Season is a tough read. The things Ilir and his family went through is heart-breaking, and as he says, they’re some of the lucky ones who managed to get out of the country. They have friends, neighbours and family who are killed. They experience police harassment, and when NATO acts there’s bombs dropping so close to their home the windows shatter. The emotions Ilir goes through during his childhood are vivid, he’s scared, angry, confused, and when it’s all over he has nightmares. The affects of the conflict on him and his family is plain to see and it’s horrible to think about the thousands of people who didn’t survive. Translated by Tara F. Chace. Christiana Mara Coelho was born into extreme poverty in Brazil. She grew up living in a cave outside Diamantina with her mother, and then survived on the streets of São Paulo where they begged for food and avoided the many dangers being homeless brought. 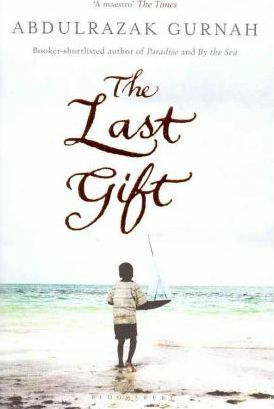 When she and her young brother are suddenly put up for adoption, everything changes for Christiana as she and her brother move across the world to a village called Vindeln in the north of Sweden, to start a new life with their adopted parents. It’s there she becomes known as Christina and must learn so many new things while missing her mother an indescribable amount. Never Stop Walking is two stories in one and they’re told in alternating chapters. There’s Christina’s childhood, growing up in the forest and on the streets, her time in an orphanage before being adopted and moving to Sweden, and there’s her as a thirty-two-year-old, going back to Brazil for the first time in search of her biological family. Christina is adopted when she was eight years old, and because of her time on the streets she had knowledge and memories, no young child should have. She’d seen her friends be beaten or killed, she’s gone hungry for days and learnt never to trust anyone in uniform. To say it was a tough childhood would be an understatement, but it’s clear that it is one that was full of love and laughter too. Christina adored her mother and her little brother Patrick (he was a baby when they were adopted so didn’t have the same memories or difficulties as Christina), and the three of them had fun and shared a lot of positive memories. Seeing how Christina as a child dealt, or didn’t, with the culture shock of moving somewhere where she was the only child who wasn’t white, who had to struggle, and who had never seen snow before, was awe-inspiring in a way. Seeing how children can be so resilient, but at the same time being sad that so many children have to go through traumatic things just because where they were born. As an adult she has culture shock again, along with a whole host of other emotions, when she returns to Brazil for the first time. She’s forgotten the language, and while some memories are clear, for so long she’s never really understood how she came to be adopted when her mother was out there somewhere, wanting to be with her. 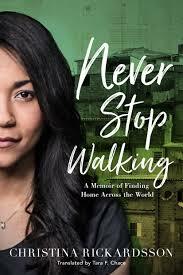 Never Stop Walking is the story of a woman finding out where she belongs and coming to an understanding that she can be both Swedish and Brazilian and that she can have a biological family and an adopted family she loves equally but in different ways. Over the course of Christina returning to Brazil and retracing her childhood, she learns many things about herself, while also affirming who she is. It’s a remarkable tale that’s told with so much raw emotion. 4/5. The body of a young boy is found dead in the landfill in a poor district outside of Manilla. His face has been cut off, and his heart and genitalia removed. The police are stretched thin and are unsure of what to do, but as another boy, and then another boy, is discovered with the same injuries, the police need help. Father Gus, a forensic anthropologist, and Father Jerome, a psychologist, are asked by the Director of the National Bureau of Investigations to help the police in their efforts to track down the killer before they strike again. Set in the late 1990’s there are quite few subplots in Smaller and Smaller Circles. There’s naturally the main plot of these murders and the police’s attempts to solve the case with the help of Father Gus and Father Jerome, but there’s story threads about the police and the Catholic Church too. The fact that the police in the Philippines don’t have good filing systems or good communications with the various departments places a major role in the story, and then with regards to the Church there’s a priest that Father Gus believes is using his power and influence to get away with abusing young boys he has access to. Father Gus and Father Jerome are both compelling characters and are both smart in their own ways. They make each other better, bouncing ideas off one another until they might get a clearer idea of any patterns or motivations regrading the killer and their victims. Their easy camaraderie is great to read about and it’s fun to see how they manage to juggle working at a university and all the things that come with that like marking papers and getting funding, and with helping the police on serious crimes. 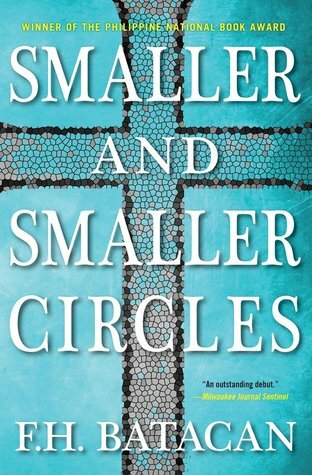 Smaller and Smaller Circles is a well-paced mystery as you as the reader have the same amount of information as the police and Father Gus and Father Jerome, and when they do have a suspect they spend the time trying to catch them and get concrete evidence. This makes the final part of the book tense as you wonder whether they’ll get to the killer before he kills again. Also, it means the ending isn’t rushed and various characters do have some form of closure. Smaller and Smaller Circles is a bit gruesome. The bodies are described vividly but clinically and there’s some unsettling characters too. It’s not too scary or creepy and instead is a good mystery that’s set in a place where crime stories aren’t usually. In fact, Smaller and Smaller Circles is credited with being the first Filipino crime novel. It brings in the politics and socio-economics of the Philippines into the story in a way that fleshes out the setting and characters but isn’t something you need to have prior knowledge of to see how a lot of these characters lives are affected by forces outside of their control. 4/5. Bassam and George are childhood best friends who have grown up on the Christian side of war-torn Beirut. On the verge of adulthood, they find their paths are looking like they will diverge. George begins to amass power in the underworld of their city; he becomes a part of the militia, and finds a passion for crime, killing and drugs. Bassam dreams of escaping the city and his home country, and the best way to fund his dreams of the West is through a series of petty crimes Their two paths collide with explosive consequences and nothing will be the same for either of them. DeNiro’s Game is told from Bassam’s perspective and it’s through his eyes you see the choices both he and George make and how it slowly makes them grow further and further apart. The audiobook of DeNiro’s Game I listened to was narrated by Jonathan Keeble and I wasn’t over keen on his narrating style. I couldn’t connect with Bassam though I’m not sure if that was wholly down to his narration or down to the writing style in general. DeNiro’s game has very poetic writing and there’s almost a constant stream of similes and metaphors from Bassam. The way bombs are described, falling on Bassam and George’s city is strangely beautiful. DeNiro’s Game is about war, what it does to people and how it changes somewhere so much. It’s a harsh look at the affects of war and in many ways, Bassam has become desensitised to it all. It’s a part of his life, he would rather be walking the streets as bombs fall rather than hide under ground in the shelter. He and George have fought to survive, and they aren’t the boys they once were. They are both in a state of hypervigilance, something that is clear to see when Bassam gets the chance to make it to the West. DeNiro’s Game is a poetic tale about lost youth and the fear of violence. Bassam might not always be a likeable character, the way he treats women for instance is often abhorrent, but he is a sympathetic one as in many ways he’s a victim of circumstance. But both he and George would never accept being called the victim of anything as at their core they’re made of steel. 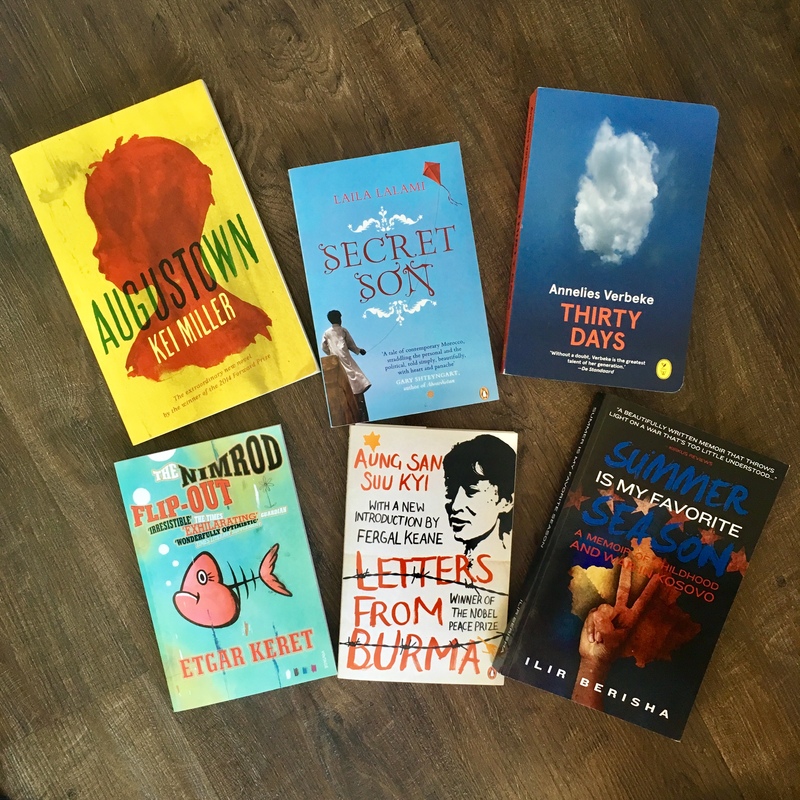 The #ReadTheWorldAthon I’m co-hosting with A Novel Haul and Ninja Book Box starts in two weeks so I thought I’d share some recommendations that fit the various squares on the readathons bingo card. 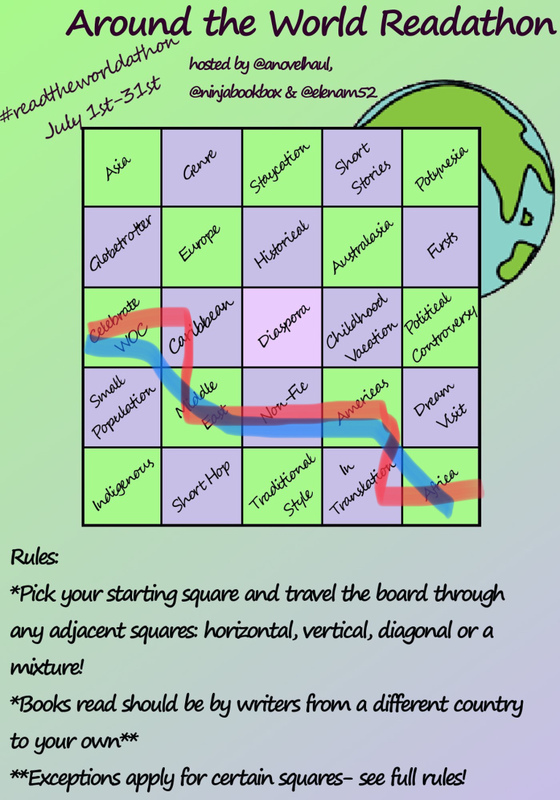 For more information on the readathon and more in-depth explanations of each square, take a look at my announcement post. Below are 22 books that fit 22 of the 25 squares, where a book can fit multiple squares, I’ve made a note of which one it. That way you’ve got more choice when planning your readathon. Asia: Gurkha: Better to Die than Live a Coward by Colour Sergeant Kailash Limbu – Nepal. An autobiography of a Gurkha. Can be used for: non-fic. Polynesia: Free Love by Sia Figel – Samoa. The story of a teenage girl embarking on a forbidden relationship. Can be used for: Celebrate Women of Colour. Europe: The Keeper of Lost Causes by Jussi Alder-Oslen – Denmark. A new unsolved crimes unit’s first case is the case of a politician who has been missing, presumed dead, for five years. Can be used for: In Translation and genre fic. Australasia: Gould’s Book of Fish: A Story in Twelve Fish by Richard Flanagan – Australia. A convict on Van Diemen’s Land in the 1830’s becomes a reluctant painter of fish. Can be used for: historical. Caribbean: Papi by Rita Indiana – Dominican Republic. A story about a young girls relationship with her absent father. Can be used for: Celebrate Women of Colour. Middle East: Persepolis by Marjane Satrapi – Iran. Autobiographical graphic novel about Satrapi’s life growing up in Iran in the 1970’s and her time in France. Can be used for: non-fic and Celebrate Women of Colour. Americas: Death Going Down by María Angélica Bosco – Argentina. A murder in an elevator puts the whole apartment block under suspicion. Can also be used for: In Translation and Genre. Africa: Homegoing by Yaa Gyasi – Ghana. A family saga spanning multiple generations following the descendants of two sisters, one who married a rich European and the other who was sold into slavery. Can be used for: Celebrate Women in Colour and historical. Staycation: Noughts and Crosses by Malorie Blackmann – England. A dystopian story set in alternate 21st-century Britain where the Crosses (Blacks) and the Noughts (Whites) are segregated with her Crosses in power. Can be used for: Celebrate Women of Colour and genre. Short Stories: The Accusation: Forbidden Stories from Inside North Korea by Bandi – North Korea. A collection of short stories about life in North Korea. Can be used for: Asia, In Translation and Political Controversy. Globetrotter: All Day at the Movies by Fiona Kidman – New Zealand. When a war widow moves to work on the tobacco fields, her act of independence triggers a ripple effect whose repercussions resonate long after her death, forever shaping her children’s lives. Can be used for: Australasia and historical. Historical: Sirius by Jonathan Crown – Germany. The story of a dog who was a part of a Jewish family, became a movie star and met Hitler. Can be used for: In Translation and Europe. Genre: Lagoon by Nnedi Okorafor – Nigeria. Science-fiction about aliens arriving in Lagos. Can also be used for: Celebrate Women in Colour and Africa. Firsts: Metro 2033 by Dmitry Glukhovsky – Russia. Set in the Moscow metro system, the last survivors of a global nuclear holocaust begin to think they’re not alone in the tunnels. This is Glukhovsky’s first novel. Can be used for: Europe and genre. Childhood Vacation: The Shadow of the Wind by Carlos Ruiz Zafón – Spain. I had my first birthday in Spain (not that I remember it but there’s photographic evidence) and it’s a country I visit every year since my dad moved there over 15 years ago. It really is my home from home. Can be used for: In Translation and Europe. Political Controversy: The Devils’ Dance by Hamid Ismailov – Uzbekistan. Ismailov’s work has been banned in Uzbekistan and he was forced to flee the country in 1992 after the authorities believed he was trying to overthrow the government. Can be used for: Asia, historical and In Translation. Small Population: Frangipani by Célestine Hitura Vaite – French Polynesia. The story of a woman’s relationship either her daughter. Can be used for: Celebrate Women in Colour and Polynesia. Dream Visit: México 20 by multiple authors – Mexico. A collection of short stories and non-fiction about life in Mexico. Can be used for: short stories, Americas and In Translation. Short Hop: Asking For It by Louise O’Neil – Ireland. A teenage girl struggles to piece together what happened to her after she wakes up on her front porch, in pain and the photos of the night are all online. I live in the UK so Ireland’s just a trip across the sea for me. Can be used for: Europe. In Translation: The Blue Fox by Sjón – Iceland. The story of a hunter and a a rare blue fox. Can be used for: Europe. Celebrate Women of Colour: Reading the Ceiling by Dayo Forster – The Gambia. On her eighteenth birthday Ayodele plans to lose her virginity but she has three men to choose from. The story follows three paths, following how her life might turn out depending on which man she chooses. Can be used for: Africa and genre. I’m afraid I don’t have any recommendations for Diaspora, Indigenous or Traditional Style. These three are areas I’m unfamiliar with and I want to use the readathon to rectify that. 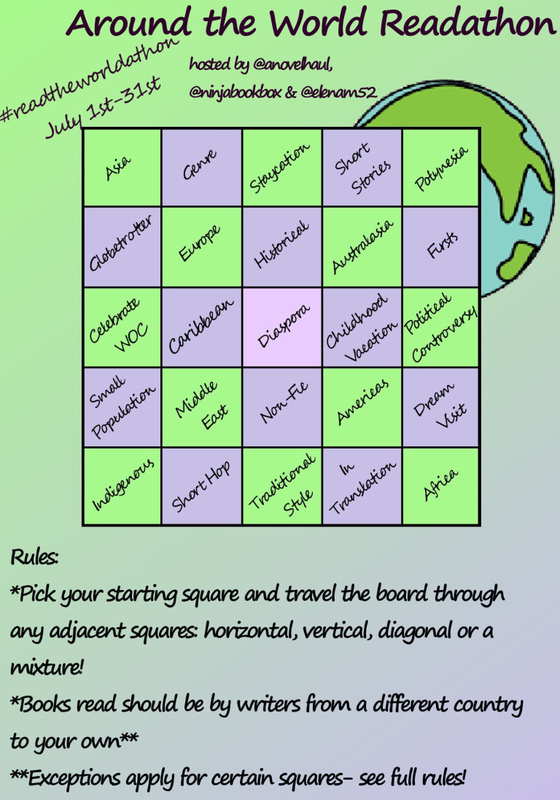 If you have any recommendations for books that fit Diaspora, Indigenous or Traditional Style, or any of the bingo squares really, I’d love to hear them.